Rising passenger numbers and an ever increasing number of arrivals and departures can make train station platforms a stressful place. Together with ProRail and NS Dutch Railways, we developed a new transfer process for the platform to improve passenger experience. We worked together to provide clear information for travelers, and reduce waiting times and crowding. As well as improving the passenger experience, it was also vital to prevent potentially dangerous situations and ensure efficient platforms use to reduce delays. Carrying out research in rail stations and on train journeys, we gained valuable insights from passengers. These insights were used in co-creation workshops where we defined the main problems and possible solutions, evaluating and improving on our ideas together with relevant stakeholders. The finished result is real-time boarding information, displayed above the platform on a 180 meter screen running the length of the platform. 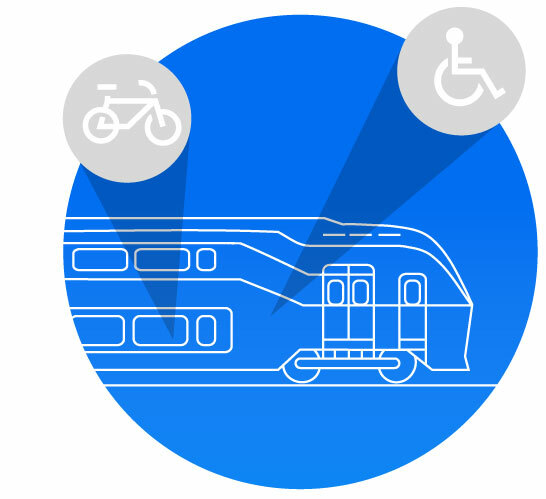 Passengers know in advance where the doors will be, which carriages have free seats, and where they can board with wheelchairs or bicycles.